Few things are worse than not knowing. Maybe not knowing the truth? Or not seeing things as they really are? Thoreau said, “It’s not what you look at that matters, it’s what you see.” Maybe he was right. He certainly had a point worth thinking about. Lately I’ve encountered frustrated business owners and CEOs who felt a greater degree of success was ahead of them. They just found themselves struggling to get past their current plateau. Plateaus aren’t bad. In fact, they’re a necessary part of growth and mastery. But they can be exhausting. Especially when it seems like you’ve been there for too long and you’ve no idea how much longer it’ll last. Funny thing about plateaus…they last however long they last. The key is to push through, persist and use them to make you more tenacious. It’s hard work though. Snarliness, toughness and all those other words I love so much that indicate how hard we are to compete against — they demand a resilience that only comes from lots of slogging through the plateaus of your career and your company. The greatest business leaders do it. It doesn’t mean they enjoy it all the time, but they use it for their advantage. Today I’d like to focus on just one element of the plateau that seems especially vicious – the isolation. 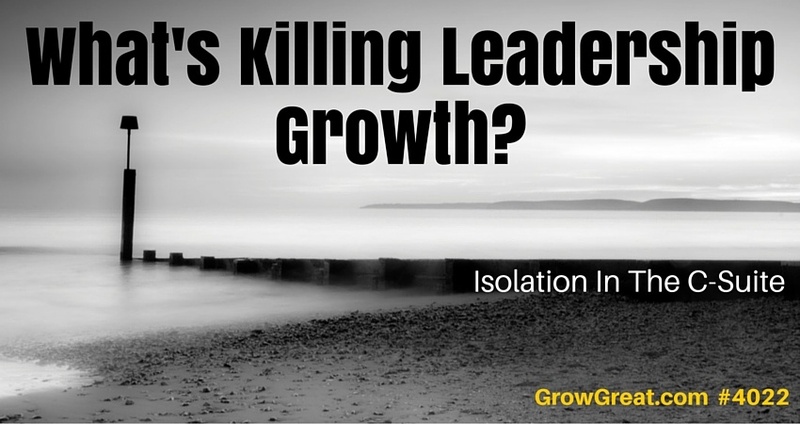 Business owners and CEOs can be among the most isolated people on the planet. And that’s under normal conditions. Tasked with one decision after another, armed with reams of data and sometimes listening to hours of internal arguments among direct reports — and then add on for good measure all the outside influencers with some agenda or consideration they think is vital to our decision-making — the isolation we can feel is quite crowded and noisy. We’re surrounded by well-meaning people. Why do we often feel isolated? Because we’re the chief decision maker. And because our decisions have the biggest impact on the company – for good, or bad. That’s the subject of today’s show. Enjoy!